If you don’t have a Jamba Juice in your area, you likely don’t realize the magnitude of what you’ve been missing. Jamba makes some of the yummiest smoothies on the planet! :) Fortunately, Jamba Juice now has a frozen smoothie mix on the market so that Jamba Juice lovers and those who don’t have access to their hundreds of locations can mix up their own smoothies at home. Yum! 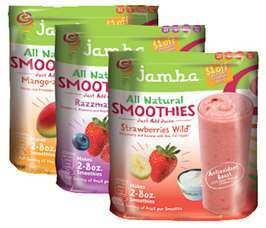 Jamba Smoothie mixes are available in Jamba Juice’s three most popular varieties, including Mango-a-Go-Go, Strawberries Wild, and my personal favorite, Razzmatazz. Yes, a delicious raspberry smoothie like no other. These all-natural frozen smoothies are so easy to make at home and they contain non-fat yogurt, frozen fruit, and a boost of antioxidants. When you get it home, you simply add your favorite fruit juice to the mix and blend. Each smoothie is low cal – strawberry (110 calories), Mango (70 calories) and Raspberry (110 calories) for the mix only – the calorie count is also affected by the juice you choose to add at home. You can cut the calories a bit more by substituting water, coconut water, or even almond milk, for the juice – you likely won’t miss it. I also like to add crushed ice to the blender to make any smoothie bulkier – which tricks me into thinking that I’m actually getting to eat (or would the appropriate term be ‘slurp’) more than I truly am. These decadent smoothies contain no fats whatsoever – no saturated fat, monounsaturated fat, polyunsaturated fat, or trans-fats, and no cholesterol. Each serving also provides 100% of the RDA for Vitamin C and two grams of protein. I was so happy to see this smoothie mix at my local Whole Foods, although you know that I’m never short on ideas for smoothies that you can make at home. I have blogged before about making a low-cal avocado smoothie, and many of your have tried my banana smoothie made with frozen bananas and topped with fat free whipped cream. I simply love the idea of the smoothie in general – its quick, its filling and its easy. Our local Wal-Mart just got these in..a bit spendy..but I think it'll be worth the splurge. Thanks for sharing your thoughts!